The biggest mistake I saw designers (including myself) making at #Unpub4 was defending our choices instead of truly reconsidering them. I think this tweet summarizes the Unpub program very well because it contains discussion points for both designers and playtesters. For designers, it is important to consider all feedback. Do not disregard feedback just because it came from a player, be sure you can provide a rationale for your decision, as a player felt that it was necessary to say. For players, it reminds us that is important to ask designers what they are looking for in regards to feedback. A designer may have chosen to limit the design of the game to 54 cards and if after the game, your feedback is add 12 more cards, it may not be helpful for the designer. I’ve seen this in my own play testing where someone will have designed a game with limited player interaction and players will ask for the ability to attack other players. It may not need to be added to the game, but the players want it because that is their play style. I vow to bring a script of questions to ask prior to sitting down to play any game at Unpub 5. The idea of player style is another excellent lesson that was discussed at length on the hashtag. Discussion centered around having playtesters who like heavy euros wear different color badges or other visual identifiers to distinguish them from playtesters interested in lighter games. This would allow designers to recruit the playtesters most likely to enjoy their game. The entire event is based on the synergy between these two groups so it is important that designer and player are communicating expectations clearly before starting to play a game. As we talk about the design and playtesting lessons we learned from Unpub I feel like it is important to thank everyone who donated physical items to the giveaway that spanned the weekend. Our gracious host gave away games on the hour (or there abouts) almost every hour of the weekend. Many games from the publishers attending Unpub(Thanks to Crash Games, Game Salute, Nevermore Games, Dice Hate Me Games, Van Ryder Games and more) as well as the designers themselves were able to be won simply by filling out feedback forms after playing a game! Event photographer Scott King (@ScottKing) donated a few copies of his gorgeous board game calendars too! Giving away things also worked as a way to get playtesters to sit at your table as Bryan Fischer was giving away pies for playing Pie Factory, The Dice Hate Me designers had buttons for their games, and Weston Stapleton, designer of Moles Holes had marble mole meeples to give away to winners. Nick Ferris, designer of Les Cartes Miserables and SuperShoppingSpree! was giving away copies of Les Cartes Miserable on Saturday to winners of a small tournament. Finally, for all attendees there was a promo pack featuring cards for a variety of games like Fleet and King’s Forge as well as other games. I know these promos will be well loved in my game collection! The penultimate Lesson from Unpub 4 was to arrive early and stay late. Many designers and publishers arrived on Thursday, allowing them to playtest games in the hotel, give each other feedback, help set up and even make an attempt at being well rested before the hall opened. If you don’t have to rush out of town to get to the airport on Sunday, you will be able to get that extra play test in and perhaps get the feedback that enables you to put the polish you want on your design before your next big pitch! What are my #LessonsFromUnpub4? 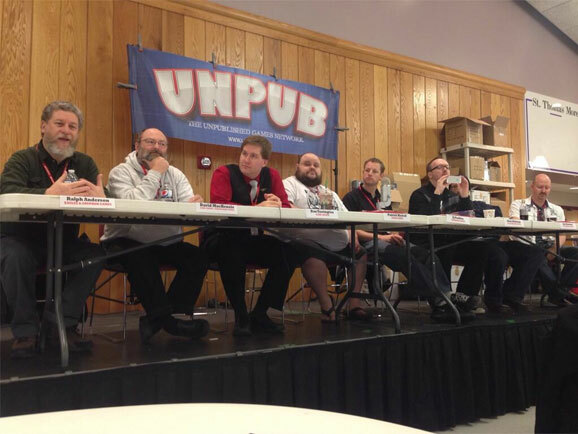 Don’t miss #Unpub; be at #Unpub5. Eric, thanks for such a great survey of Lessons from UnPub. Had a great time playing Nathaniel Levan’s “10 Acres” with you. Your “come early stay late” lesson rings true; I arrived Friday night and had to leave Sunday afternoon. I don’t have a lesson so much as an observation: There just isn’t enough time to do everything you want to do at UnPub. It would be great if you would publish that list so game designers have a reference to see what potential players might want to know. How about asking other people for their questions to make a grand list? Instead of playtesters wearing badges it might be better for designers to put badges on their games. If a player self-identifies him/herself as a certain type of player he/she might be unwilling to venture out from that identification even if they might otherwise be open to a variety of game styles.